In today's competitive marketplace, converters are being asked to reduce both time to market and warehouse turnovers, they must also deal with shorter runs and unexpected changes without forgetting the necessity of achieving higher production goals and ensuring quality. Consumer purchasing trends are increasing the pressure on packaging converters as brands look to them not only for improved execution, but also for innovation. Comexi keeps demonstrating its commitment towards customer success and satisfaction through innovation with the continuous release of solutions based in automation and dedicated to solve daily production problems while committing to every new trend in the market. Flexible packaging presses are being constantly challenged to improve their processes and efficiencies to compress manufacturing time, lower costs and achieve great quality standards. Market researches point towards a constant reduction on the job length due to the quick and constant demand of changes by the brand owners, making the reduction of time - during job changeovers- more important. The involvement in reducing machine downtimes, increasing printing quality at maximum speed, and the improvement of working conditions in a disruptive way was the catalyst that triggered the development of the new F1, the flexographic printing machine with an automatic device for sleeve changeover. An innovative solution that incorporates a robot capable of automatically manipulating anilox, plate and intermediate sleeves to reduce the necessary time for job changeover, while being able to achieve a maximum speed of 600 meters per minute. A great answer to the converter’s current needs. Simulations and comparisons made both at the Comexi facilities and at customer facilities between the two working systems (machine with and without robotic system and without robot) demonstrate improvements in sleeve changeover time that range from almost a 30% to a maximum reduction of almost a 90%. The bigger improvement takes place when the press needs to change from one set of intermediate sleeves to another one. This scenario, although plant managers will try to avoid it at a maximum, is a still quite frequent in any printing plant. The following image illustrates the increase in production capacity and the number of orders that can be managed using a machine with a robot. Possibility of replicating the process colours in the inner and outer decks. 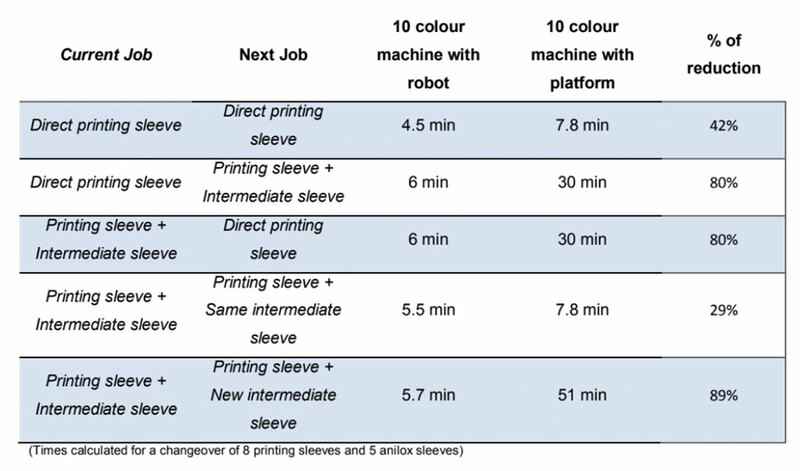 The robot can change the sleeves of the unused decks while the machine is printing. No need to change anilox. No need to change inks. No need for colour matching on press. The sum of all these factors can provide machine uptimes close to 90%. In pursuing efficiency, it is necessary that the entire process and management has been designed and studied to achieve this goal. When it comes to monitoring and ensuring quality, companies are launching new systems capable of finding the exact point for optimal printing quality with minimum overpressure, thus leading to increased productivity of the full printing process due to the reduction of the wasted time for cleaning plates. This would be the case of the Comexi Cingular Real, the new and automatic system capable of comparing the real printed image with the digital file of the job, allowing printers for a consistent, easy and fully automatic pressure and register set up with minimum waste. Additionally, there is another step in the pursuit of efficiency. Comexi is pioneering in the quick adaptation to the fourth industrial revolution with the development of innovative production control tools that help our customers to improve their plant performance through the analysis of historical production data and that allow them the implementation of smart factories. Monitoring and analysis of data is the first step in the long but quick-evolving motorway towards machine intelligence and autonomy. Plant monitoring, in order to have real time information and to know what is happening. Production control, to have a complete database of historical information regarding set up parameters. KPI, customizable board with the information that customers consider necessary to control their plants. Everything aims at acquiring the necessary data to manage resources efficiently, increase manufacturing flexibility, and to increase profitability. Taking all this into consideration, data management in plants is and will be the new challenge that the industry will have to face. The plants will be more efficient as long as production processes are well known and can adapt better to customer demand needs. We can conclude that, whether machine manufacturers opt for disruptive innovation or gradual and incremental improvements to face nowadays challenges, there is a common trend in developing solutions that target efficiency to satisfy flexible packaging market needs: automation and cloud solutions will become necessary for survival through profitability in the quickly changing environment of the flexible packaging market. Selling in a market where there is a fierce competition force you to reinvent yourself. As commented before the market is tending to more customized products so the jobs length average is shorter. At the same time customers want better products in terms of shelf life and usability. It means that they need more complex structures and sometimes with added value finishing solutions like lasered easy openings. Companies are being forced to lead with complexity and a rise of SKU’s. So, companies need slitters able to deal with more complicate jobs and able to avoid being stopped. Changeover is critical. Regarding this a simple cantilevered machine can be working just 30% of the time. We can improve this ratio up to 70% if we use the added value solutions available today such as double turret rewinders, automatic knife positioning, automatic core positioning, automatic taping and so on. And this can even be improved if we automate all the steps that occur after the slitting such as labelling, wrapping or palletizing thanks to robots connected to our slitters. If you want a highlight I would say that the key is to never stop. The slitter is, in many cases, the last machine touching the reels on a converting plant. However, it is not the last link before reaching the end customer since, before the final delivery, there is usually a series of finishing processes. All these operations - transport, labeling, weighing, bagging, palletizing - add up minutes to the time that the reel is inside the company. Minutes that only make the product more expensive. If we are able to integrate all these processes and link them together we make machines that don’t stop, eliminating downtime between step and step, optimizing and increasing production. Thanks to automation, the reduction of cycles and downtime is radical. We have checked cases in which, thanks to having all these systems connected, the company has been able to carry out in 2 shifts what it used to do in 3 and, in addition, with 60% less staff. However, although the most striking fact when calculating ROI is the savings in salary costs, there is another great benefit that is more difficult to measure. When a manual operation is repeatedly performed there is always a percentage of error, whether due to fatigue or distractions. It is easy for there to be some badly placed label or a reel located in an incorrect lot. Although companies have methods in place to improve efficiency, it is very likely that defective reels will be delivered to each customer if they are delivered manually. When we talk about hundreds or thousands of reels, even if the companies reach error rates lower than 0.5%, there will always be defective reels in each delivery. These percentages can also be greatly improved with automation in the slitting area, with industry 4.0, which, at the same time, improves traceability. The demand of brand owners with the parameters of quality increases day by day and that is why it will be increasingly difficult to meet them without the help of robots or a better and innovated slitting area. So, automation can be the way to achieve zero defects on the delivery. We imagine that in the future all the machines of the plant will be connected to a cloud system linked to a complete automate system that will help the companies. Not only on giving them different KPI ratios but also with giving them recommendations on how to produce the jobs.